Rate this project Univention Corporate Server (UCS) is a Debian-based server distribution that offers an integrated management system for central administration of servers, Microsoft Active Directory-compatible domain services, and functions for parallel operation of virtualised server and desktop operating systems. The Univention team has published a point release update for the distribution's 4.3 series, Univention Corporate Server 4.3-2. The new version contains mostly bug fixes and minor updates as listed in the distribution's release announcement: "During the upgrade to new UCS release- or patchlevel versions, the Univention Management Console is put into maintenance mode. While the maintenance mode is active, the progress of the update is displayed on a simple web page. Samba has been updated to version 4.7.8. For security reasons, authentication with NTLMv1 is no longer allowed. If there are still old systems or applications in use that absolutely need NTLMv1, this can be reactivated via the Univention Configuration Registry. The AD connector has been enhanced with tools to synchronize individual objects or entire subtrees again and to specifically remove rejects. Various security updates have been integrated into UCS 4.3-2, e.g. Apache 2, the Linux kernel and Samba 4." The release notes contain further details. Download: UCS_4.3-2-amd64.iso (1,232MB, MD5, pkglist). Univention Corporate Server (UCS) is an enterprise-class distribution based on Debian GNU/Linux. The project's latest release is Univention Corporate Server 4.4-0, which is based on Debian 9 "Stretch". "Univention is pleased to announce the availability of Univention Corporate Server (UCS) 4.4-0, the fourth minor release of UCS 4. It provides several feature improvements and extensions, new properties as well as various improvements and bug fixes. Here is an overview of the most important changes: With this release the new app Admin Diary is available, with which administrative events of all UCS instances of a domain can be viewed and evaluated centrally. Changes to users, groups or other objects in the directory service can be tracked just as easily as updates to servers or (de-)installations of apps. The Admin Diary is delivered as two components: a backend for data storage in an SQL database and a frontend for integration into the UMC. Recording of events is part of UCS 4.4 and is automatically activated when the backend is installed. The self-service app has been enhanced in two areas: End users can now use the self-service web interface not only for changing passwords, but also for editing their own contact information." Additional details can be found in the project's release announcement. Download: UCS_4.4-0-amd64.iso (1,229MB, MD5, pkglist). Stefan Gohmann has announced the release of Univention Corporate Server (UCS) 4.3-3, the latest update of the project's Debian-based distribution for servers with a web-based administration system: "Third point release for Univention Corporate Server (UCS) 4.3 is now available. It includes a number of important updates and various new features. The portal is the starting point for many UCS users and administrators. As described in the blog article Design the UCS Portal with Drag & Drop, you can adapt it very easily to your needs. The 'Applications' and 'Administration' categories were static until now. We have extended the portal so that you can now define your own categories. In addition, you can add static links to the portal. In many environments different users should be shown different tiles. To do this, the group members for whom a particular tile is displayed are stored in the tiles. Previously, you could only assign each tile to one group. With UCS 4.3-3 you can now assign several groups to each tile. As soon as a user is a member of one of these groups, the corresponding tile will be displayed." See the release announcement and release notes for further information. Download: UCS_4.3-3-amd64.iso (1,225MB, MD5, pkglist). Univention Corporate Server (UCS) is a Debian-based server distribution that offers an integrated management system for central administration of servers, Microsoft Active Directory-compatible domain services, and functions for parallel operation of virtualised server and desktop operating systems. The Univention team has published a point release update for the distribution's 4.3 series, Univention Corporate Server 4.3-1. The release announcement mentions the following changes: "The UMC system diagnostic module has been extended with additional tests. They support the administrator to check the system health of the UCS system and the whole domain. The management system usability and configurability has been expanded. The expected usability has been improved in several places, for example when configuring email addresses or DNS settings. A content-security-policy has been integrated in the UCS management system to increase the browser security by protecting web cookies. Various security updates have been integrated into UCS 4.3-1, e.g. Apache2, the Linux kernel and Samba4. A complete list is available in the release notes." Download: UCS_4.3-1-amd64.iso (1,205MB, MD5, pkglist). Univention Corporate Server (UCS) is an enterprise-class distribution based on Debian GNU/Linux. The developers have published a new release, version UCS 4.3-0. The latest version is based on Debian 9 and now uses an unmodified Debian kernel. The distribution also features new Samba packages and improved SAML authentication. "We are very happy to announce the availability of Univention Corporate Server (UCS) 4.3. Considerable highlights are: UCS 4.3 is based on Debian GNU/Linux 9 (Stretch). More than 20,000 source packages have been updated and some have been adapted to the needs of UCS users. The Linux kernel of Debian GNU/Linux is now used unmodified. This greatly improves compatibility to hardware and software which has been certified for Debian 9. Also new in UCS 4.3 are e.g. MariaDB and Nagios 4. The portal pages introduced with the UCS 4.2 gave users a simple way to access applications relevant to them. With UCS 4.3, administrators can easily build and manage these portals in visual composer mode and via drag and drop. It is now also possible to show different content to different users, depending on their group membership, permissions, department, branch or school. With UCS 4.3, SAML authentication is linked to the Kerberos login." Additional details can be found in the company's release announcement. Download: UCS_4.3-0-amd64.iso (1,217MB, MD5, pkglist). Univention Corporate Server (UCS) is an enterprise-class distribution based on Debian GNU/Linux. It features an integrated management system for central administration of servers. Univention has released an upgrade to their 4.2 series, Univention Corporate Server 4.2-3. The new version features diagnostic tests to help trouble-shoot server and domain issues, along with various improvements to the web-based interface. The release announcement reports: "We are pleased to announce the availability of UCS 4.2-3 for download, the third point release of Univention Corporate Server (UCS) 4.2. It includes all errata updates issued for UCS 4.2-2 and provides various improvements and bug fixes especially in the following areas: For the UMC diagnostic module, a large number of additional functional tests have been added to help the administrator check the health of the server and the entire domain. The usability and configurability of the management system were further expanded. The design of the assistants and dialogues of the management system was revised with regard to usability aspects. Additional configuration options for the single sign-on of the management system have also been added, e. g. the configurability of the certificate used." Further information can be found in the release notes. Download: UCS_4.2-3-amd64.iso (1,053MB, MD5, torrent, pkglist). Nico Gulden has announced the release of Univention Corporate Server (UCS) 4.2-2, a new build of the Debian-based server distribution featuring a web-based management system for central administration of servers. "We are pleased to announce the availability of UCS 4.2-2 for download, the second point release of Univention Corporate Server (UCS) 4.2. It includes all errata updates issued for UCS 4.2-1 and provides various improvements and bug fixes especially in the following areas: The portal is now also easily usable in cloud setups. 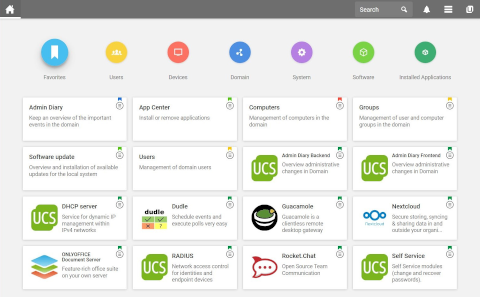 The services installed on UCS, for example, are directly accessible without further configuration steps. For this purpose, the portal converts existing links into relative links. For portal entries with multiple links, heuristic procedures are used to determine the best link. The usability of the management system has been further improved. This allows users and groups to be copied, the error handling has been improved in several places, as did the performance." 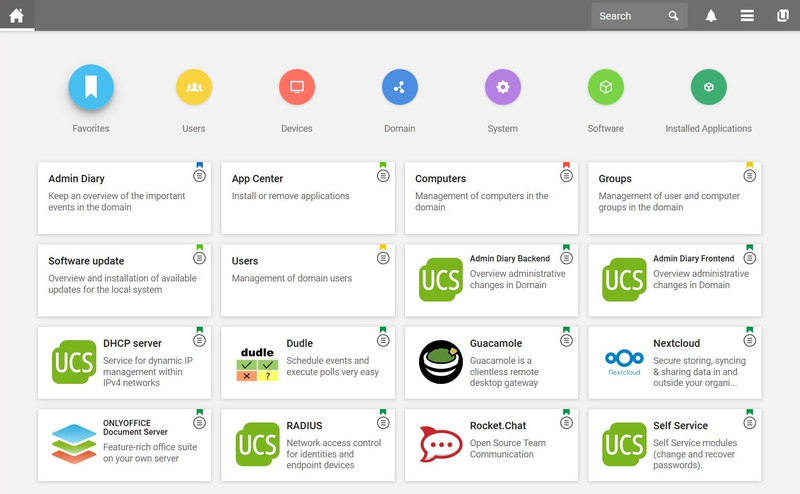 There have also been improvements to help app providers quickly create UCS appliances. Additional information can be found in the release announcement and in the release notes. Download: UCS_4.2-2-amd64.iso (1,053MB, MD5, pkglist). Nico Gulden has announced the release of Univention Corporate Server (UCS) 4.2-1, a new build of the Debian-based server distribution featuring a web-based management system for central administration of servers: "We are pleased to announce the availability of UCS 4.2-1 for download, the first point release of Univention Corporate Server (UCS) 4.2. It includes all errata updates issued for UCS 4.2-1 and provides various improvements and bug fixes especially in the following areas: forwarding of emails can now be set per mail user in the management system; changing the password to log on to the UCS management system has been improved, this allows users from a Microsoft Active Directory domain to change their expired password; when logging on as root user, a hint now appears, since for root the domain modules are not available; the IPv6 configuration capabilities of various services have been improved, for example in the Nagios or proxy server configuration and in the management system; the App Center docker integration has been improved, so it reacts better to errors." See the release announcement and release notes for further information. Download: UCS_4.2-1-amd64.iso (1,123MB, MD5, pkglist). Univention Corporate Server (UCS) is a Debian-based Linux distribution for enterprise server environments. The Univention team has announced the release of Univention Corporate Server 4.2-0. The new version shifts the distribution's base from Debian 7 to Debian 8 which also transitions UCS from using SysV init to the systemd init software. "We are very happy to announce the availability of Univention Corporate Server (UCS) 4.2. Considerable highlights are: The Debian base in UCS was changed from Debian 7 (Wheezy) to Debian 8 (Jessie). The entire Debian distribution will no longer be rebuilt. This allows security updates to be released even faster, and binary compatibility is increased. This change also involves the switch of the default start-up system to systemd. However, all previous init scripts are still started, so that the apps can be migrated successively. A configurable web portal provides an overview of the services installed in the domain. If there is more than one UCS system in the domain, an overview of servers is displayed." Further information on UCS 4.2-0 can be found in the company's release announcement and release notes. Download: UCS_4.2-0-amd64.iso (1,122MB, MD5, pkglist).